A friendly older person is seeking a Sharer for their home to give them a mix of 15 hours’ help and company each week in exchange for the low-cost accommodation. This person would really benefit from some practical help around the house including cooking some meals and helping with ironing, working the DVD player, light cleaning/tidying plus the reassurance of having someone around their home in the evenings/overnight. 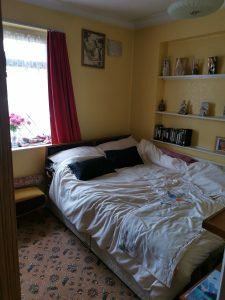 The accommodation on offeris a furnished double bedroom and shared use of the home’s other facilities. The property is located in a lovely residential area approx. 30 mins walk from Gidea Park Station. There is off street parking available. The person enjoys listening to music, watching TV, art/painting, going for walks, jigsaw puzzles, and may also enjoy playing the occasional board game. They like eating Indian food, fish and chips, eggs and prawns.